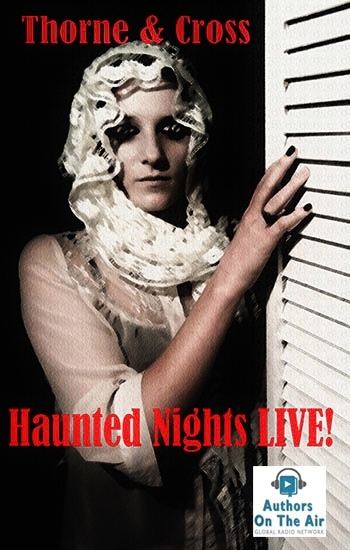 Tags: ghost stories, real ghosts, Shows about ghosts, Thorne & Cross: Haunted Nights LIVE! Posted: October 15, 2014 in Ghost Stories, Halloween, horror, Paranormal activity, Thorne & Cross: Haunted Nights LIVE! Thorne & Cross: Haunted Nights LIVE! will debut on Authors on the Air Global Radio Network on Thursday, November 6th, at 9:00 p.m. Eastern. With two million listeners in 44 countries, we are proud and excited to be a part of this network, and now, you can give us a like on Facebook at our own Haunted Nights LIVE! page. Our guest list so far includes New York Times Bestselling author Douglas Clegg, International Horror Guild Award winner Glen Hirshberg, children’s author extraordinaire Q.L. Pearce, bestselling Bite Club author Hal Bodner, and paranormal writer and researcher, Sylvia Shults – and that’s just the tip of the blood-covered machete.